2) Don’t be a dum-dum! 4) What’s Your Definition of a Sleeper? 6) You Want to Make Smart Wagers? Let’s start with the man in the middle for the Pelicans, the dude pointing out RotoEvil to you, da Brow Anthony Davis. He’s going to be the #1 or #2 pick in the vast majority of leagues this season, and for good reason. 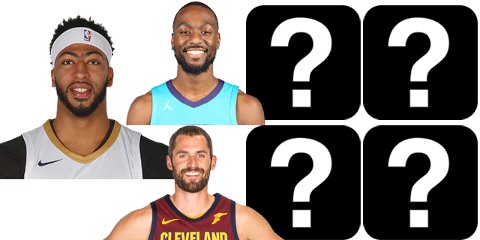 I previewed our Cornerstone Combos article with this image of AD alongside Kemba Walker, Kevin Love and 4 other potential teammates. Now here is the write-up on Davis, Kemba and Love, plus I’ll reveal one more guy that’s a lot like AD. In 9-cat leagues especially, Davis was worthy of fantasy MVP honors last year. The Brow scored 28+ ppg for the 2nd straight season, and he should seriously contend for the league’s scoring title in 2018-19. Anthony’s efficiency has always been impressive, and last season he was superb at over 53% FG and nearly 83% FT shooting. AD was 5th in rebounding with 11.1 boards per game, but where he really blew away the rest of the league was with his shot-blocking, where his 193 total swats was 56 more than the guy who finished 2nd (Clint Capela). Davis also grabbed 1.5+ steals per game, which ranked him 15th overall. So Unibrow is still an ultra-efficient scoring machine who wreaks havoc on defense, while keeping his turnovers down compared to other superstars. On the downside, Ant’s 2.3 assists per game last year was a career-high, so you’ll want to grab some stud point guards early on to make up for that weakness. And while AD is slowly becoming a bigger 3-point threat (his .7 treys per game and 34% 3P shooting were career-highs), he’s still below average in that category. So in Roto leagues, you’ll also want to target some outside shooters. In H2H leagues it makes sense to punt one of those categories, preferably assists since you’re trying to keep your team’s turnovers down. And when you decide to draft more bigs, try not to take one of the FT% killers. Near the end of the 2nd round, Kemba is a great guard to team up with AD. Walker has been a lock for 22+ points, 5.5+ assists and around 3 triples per game the past two seasons. Kemba also does an excellent job of getting to the foul line and knocking down his freebies, ranking 21st in FTA and 19th in FT% last year. As a bonus for 9-cat owners, Walker turned the ball over just 2.2 times per game last year, meaning Ant and Kemba combined for the same number of turnovers as James Harden (4.4). If you want to form a sweet shooting big man duo right away, go with Davis and Love. Kevin is poised to become a 20/10 threat again now that LeBron is gone, and he shot a scorching 88% FT last year, tops among all big men (this will make you very tough to beat in PTS, REBS and FT%). Love will also be making plenty of threes, and his 1.7 assists from last season could easily double if he improves his playmaking. And Kevin is another low turnover guy, maintaining one of AD’s advantages in 9-cat leagues. If you want another active defender, look no further than Draymond Green. Dray has been a lock for 1.4+ steals and 1.3+ blocks per game in each of the past four seasons, and he even led the league with 2.0 steals per game in 2016-17. While Green doesn’t score a lot or post elite shooting %’s like Davis, his ability to average 7+ boards and 7+ assists is huge for fantasy purposes. Forming a Davis-Walker-Green trio is a well-rounded start to your fantasy squad. As Dennis Reynolds might say, any dum-dum can tell you that Anthony Davis is an awesome player to build around, and yes, the majority of fantasy hoops owners do a perfectly fine job of drafting in the first few rounds. It’s what happens AFTER those early rounds that usually separates the winners from the losers. For example, out of the following group of centers, which big man should you probably avoid?? Our Basic draft guide gives you 15 guys while our Ultimate draft guide gives you 45 players to Avoid or Be Very Careful of on draft day, and this guy is one of them! 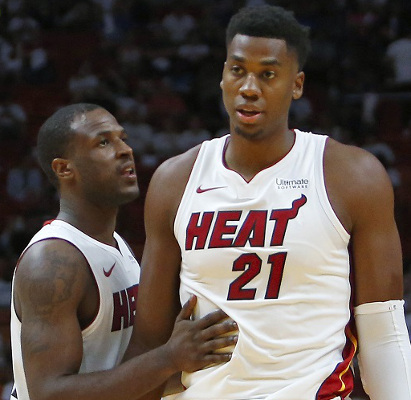 Whiteside has only been an impact NBA player for the past four seasons, but he’s already 29 years old now because he squandered away his first four years after being drafted. Backing him up, Miami has a more versatile offensive weapon in the 27 year old Kelly Olynyk, and a more energetic and wildly athletic big man in the 21 year old Bam Adebayo. Heat management would love to move off the $52 million that they still owe Hassan, but it will be hard for them to find a taker. So no, I do NOT expect Whiteside to bounce back this season, and to be honest… I think he’s kind of a dum-dum! In addition to articles, our Ultimate Draft Guide has extra TOOLS to help with honing in on what players to target and avoid. For example, in Eric’s Top Secret Tiers spreadsheet, players (like that group of centers above) are color coded, to show which guys I’m definitely targeting, which guys I’m okay with, and which guys I dislike. These Top Secret Tiers are super easy to follow, and this helps ensure that you’re making smart decisions. Our Ultimate Draft Guide also features 20 Bounce Back Ballers + 5 Career Year Candidates (Basic users get fewer picks). No CYC picks will be revealed here, but here are some of our picks for guys that are primed to bounce back. 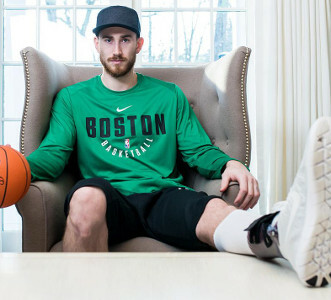 Just 5 minutes into Boston’s season opener, Hayward suffered a brutal lower leg injury. As such, Gordon will show up near the bottom of lists when people are looking at last year’s stats. But Hayward was an All-Star in 2016-17 (21.9 points, 5.4 rebounds, 3.5 assists, 2.0 threes, 47% FG, 84% FT), and he appears to be 100% healthy heading into 2018-19. Some fans may still shy away because he won’t get as many shot attempts as he did in Utah given Boston’s excellent depth and offensive arsenal, but Gordon will surely go back to being a must-start fantasy starter. A torn ACL in his left knee kept LaVine on the sidelines until mid-January last season, and he only played in 24 games before Chicago shut him down for the final month of the season. And Zach’s stats were obviously muted considering he played just 27.3 minutes per game, down from a robust 37.2 mpg for Minnesota the year prior (when he posted 18.9 points and 2.6 triples per game on 46% FG and 39% 3P shooting). Nonetheless, the Bulls chose to match Sacramento’s lavish 4 year, $78 million offer sheet over the summer, putting extra pressure on LaVine to take his game to another level. Considering he’s just 23 years old and should be fully healthy heading into 2018-19, signs are good that he’ll bounce back. It’s a little harder to be optimistic about Parker vs. LaVine simply because Jabari has torn the ACL in his left knee TWICE in a span of less than three years. But the Bulls were undeterred in free agency, offering Parker $40 million over 2 years (with the 2nd season smartly being a team option). It’s not exactly a perfect fit, as Jabari has played the majority of his NBA minutes at power forward, which is Lauri Markkanen’s spot. But Parker should get plenty of chances to prove that he’s a better outside shooter and more versatile defender than advertised, and the hometown kid (born and raised in Chicago) has extra incentive to bounce back. Other fantasy sites love to use the word “sleeper” as much as possible, but here at RotoEvil? I don’t think so, homie don’t play dat! Above I identified Zach LaVine and Jabari Parker as Bounce Back Ballers. So for a Bulls sleeper, do you think we’ll be talking about Lauri Markkanen, Kris Dunn or Wendell Carter? NOPE. Even serious NBA fans may have trouble recognizing this guy. It’s Antonio freakin’ Blakeney, and he’s chasing his NBA dream. Blakeney totaled just 314 minutes last year for the Bulls and he shot just 37% from the field for them, but Chicago still re-signed him over the summer for $3 million guaranteed over the next two years. That’s partly because Antonio impressed in summer league by averaging 21 points, 4.4 rebounds, 2.8 dimes and 1 steal in 30.6 mpg over five games, while showcasing blazing quickness and a desire to push the pace and put pressure on defenses. So Tone Blakey was also just too damn good for the G-League last season, averaging a whopping 32.0 points per game over 32 games played (only three other guys averaged 25+ ppg, and two of them were Quinn Cook and Trey Burke, guys who performed well when called upon for the Dubs and Knicks last season). 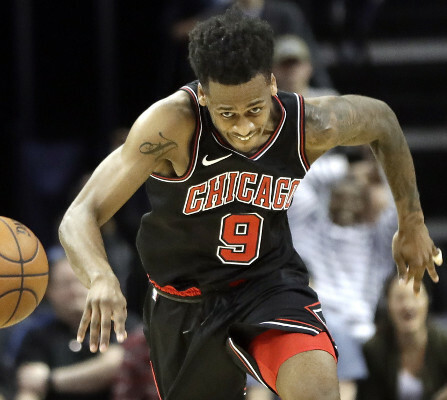 On the Bulls this season, Blakeney simply needs to outplay Justin Holiday (Jus will make him work for it) and Cameron Payne (Payne should be a pushover), and if he can he’ll become Chicago’s 1st guard off the bench. Most NBA fans still have no clue who Blakeney is, but now you do, so don’t sleep! RotoEvil has stat projections for over 380+ players, but here we’re just going to focus on two somewhat polarizing players: LeBron James and Trae Young. I’ll admit, I kinda wanted to see LeBron go to the 76ers because a supertrio of LeBron-Embiid-Simmons and freakin’ JJ Redick running around drilling threes would probably be the only team with a chance of beating this year’s Warriors + Cousins team. Oh well, the Lakers it is, and all I can say is, I’m glad I don’t live in LA!! All LeBron did last year was play in all 82 games and lead the league with 3,026 regular season minutes, then play another 22 games and 922 minutes in the playoffs, at the ripe age of 33. His stats were money last season: 27.5 pts, 8.6 rebs, 9.1 ast, 1.4 steals, .9 blocks, 1.8 threes, 54% FG, 73% FT. So what can we expect in the purple and gold? I have James sitting out 5 games and his minutes coming down a bit, and I’ll be pretty shocked/impressed if he plays in all 82 games again. I have his points and rebounds coming down a tad, but where he’ll take the biggest hit is in assists, as Rondo and Lonzo especially will also be looking to drop dimes. The steals and blocks I don’t have improving either, but maybe if James is conserving more energy on offense due to less playmaking duties, he can step up his effort on D.
What our RotoEvil Draft Tool is great for is customized rankings, as you can quickly re-rank guys based on different strategies with just a couple of clicks. For example, it’s interesting to note how LeBron currently ranks #8 when factoring standard eight categories, but he jumps up to #3 when deciding to punt FT%. The Hawks really wanted Trae Young and they got their man, and they even made sure to boot old point guard Dennis Schroder out the door before setting up the welcome mat. So it’s the rookie and Jeremy Lin who will be running point duties for ATL this year, and Young should get all the minutes that he can handle. I’m projecting Trae for 10 games missed and 32 mpg. Others might be expecting less than 30 mpg for Trae due to Lin’s presence, but I expect Lin to be sliding over to the two quite often, so he’ll still be getting good minutes. But can Trae’s body handle the physicality of the NBA? Maybe, but he’ll need to prove it first. Young has serious range on his shot but he didn’t shoot the 3-ball that well in college and he also looked streaky in summer league, so I’m projecting him to make just 1/3 of his triples as a rookie. The 38.3% FG mark seems fair to me, with his range for this season probably between 36% (ouch) to 41% FG (over 40% would be a feat for him IMO). His free throw shooting will definitely be nice, but the main question there again goes back to the physicality. Will Young be avoiding contact once he gets into the lane and not be getting to the line much as a result, or will he put his body on the line and keep attacking, in order to try and attempt 5+ freebies per game like all of the league’s top scorers do? The strongest cat for Trae as a rookie should be his assists, as many pundits and former players (including Hall of Famer Steve Nash) have credited him for having great vision & passing skills, and he has some talented athletes to play with on the Hawks. Of course he’s going to be making lots of mistakes however (projecting 4.1 turnovers and just a 1.66 ast/to ratio), and it will be interesting to see how long it takes for “the game to slow down” for young Trae. For fantasy, I’m liking Young a lot in points-based leagues where his FG% won’t hurt you, and I also think he’s an interesting pick for a H2H team that’s punting that category. For example, our Draft Tool suggests that Trae could be a Top 40 fantasy player when throwing FG% out the window! But in Roto leagues, I might only pull the trigger on Trae if I’m confident that my team’s FG% is already very strong, or if I REALLY need assist help. He’s definitely going to get some numbers, but one would expect Young’s rookie season to be at least a little bit rocky and unreliable at times. We’re in the process of sports gambling being legalized, and the NBA is smartly jumping on board. Now I’m not a big fan of betting on NBA point spreads from game to game, but I’ve had very good success on future and prop bets, such as over/under team wins and whether or not teams will win their division or make/miss the playoffs. And on these types of wagers I don’t consider it gambling, because my success ratio over the past three seasons is right around 70%. For Ultimate Draft Guide users, I’ve already given out eight recommended wagers, with more likely to come during preseason. A couple in particular I am hyping up as “VERY STRONG” bets, and I’m quite certain that anyone following my recommendations will be coming out as winners. So in addition to being able to WIN BIG in your fantasy leagues, RotoEvil also helps you win big with recommended wagers, and you’re only a couple steps away from accessing those picks! 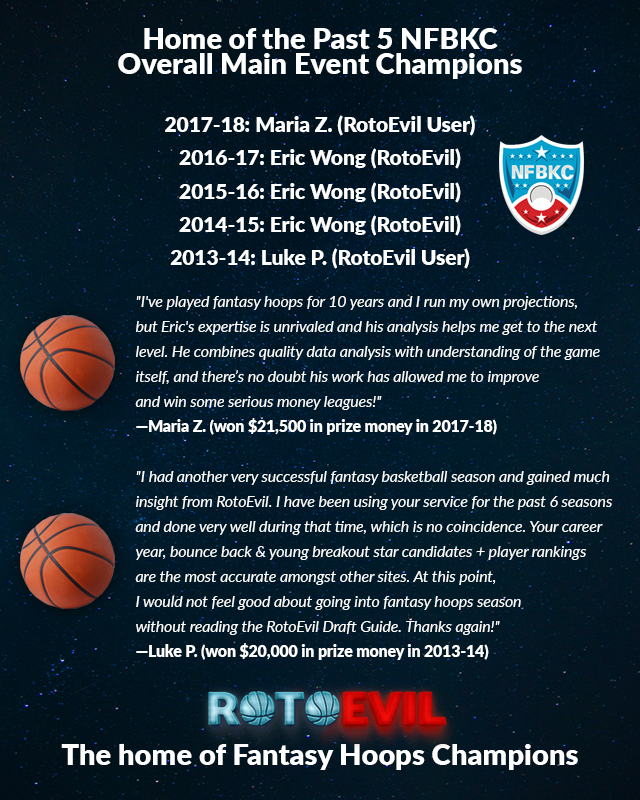 Are you ready to be a part of RotoEvil Nation?